What is Win Loss Analysis? 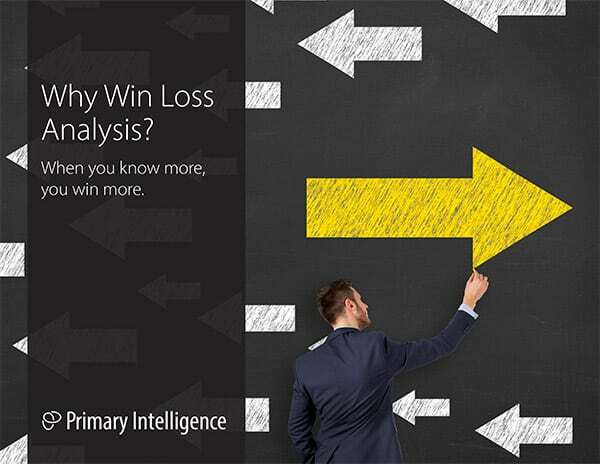 Home > Resources > eBooks > Why Win Loss Analysis? Take a short 5-minute survey to download a free copy of the report. When you know more, you win more. Did you know companies who study past deals have a 3-7x higher win rate? Win Loss Analysis may seem tactical. In reality the process delivers strategic insights which help you dramatically increase your win rate, gain competitive intel, understand how buyers see your products and be more precise in your marketing. WordPress Theme built by Shufflehound. © 2000–2019 Primary Intelligence. All rights reserved.